Glenshee’s scenic mountains have hunting parties, well worn hill trails and the ‘fairy burn’ as part of its mystical history. Today the day to day activities of locals in the glen come primarily from farming, field sports and the tourist trade, however most activities are not that far distant from our Glenshee ancestors. Glenshee under the watchful eyes of the fairies offers a wide choice of activities – whether you are after a central touring location to base yourself in, a wide choice of sporting activities to keep the family busy or a spot of hillwalking and wildlife watching. Hillwalking: Take in the magnificent scenery of the Glenshee mountains with many low level walks………. Good estate tracks run close to the rivers in Glen Lochsie and Glen Taitneach ( OS Landranger map 43). For the more challenging walks there are many fine mountains in the immediate area including The Cairnwell, Carn a Gheoidh, Glas Maol, Creag Leach, Glas Tulaichean and Ben Gulabin. For the munroe bagger there are 21 munroes within a 14 mile radius of the Cairnwell pass. Pick up a copy of the Glenshee Outdoor Activity Guide with over 22 recommended local walks. Recommended walking trails for walkers of all abilities in Glenshee. Fishing: There’s fishing for trout and salmon on the doorstep in Glenshee. The salmon and trout fishing season on Shee Water and Black Water is from 15 April to 15 October. Loch trout fishing is also available on a couple of local lochs, Loch Nan Eun and Loch Beanie are perfect for a day out walking and fishing. Cycling: For cycling both off road and on, the area is already well regarded with quiet scenic back roads and exciting off road tracks. Mountain bikes can be hired locally, the easy to moderate walking trails of Glenshee make a great active day out on a bike. Golf: Glenshee is home to one of the highest courses in Britain. A well kept hilly 9 hole course surrounded by lovely Glenshee scenic views is not to be missed. Shooting: Clay shooting, shotgun shooting and stalking are all available at local estates and activity centres. On Land: archery, cross bows, indoor crate climbing, rock climbing and abseiling, ropes course, zip wire, indoor climbing wall, team building days, tennis. Canyoning/Gorge Walking: High adrenaline activities of cliff jumping and waterfall abseils. 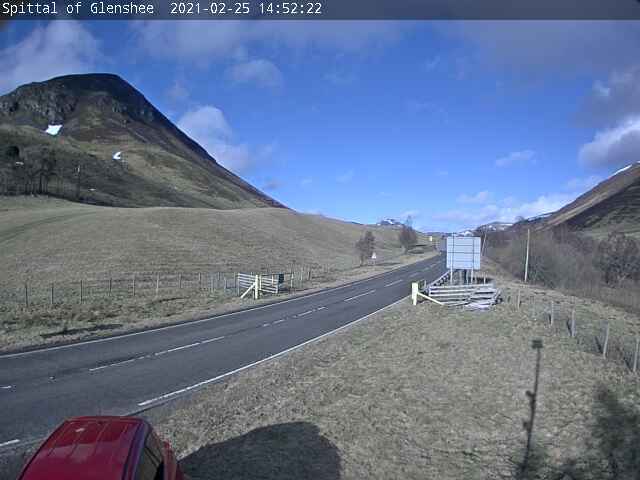 Craft: There are numerous scenic spots in peaceful locations to spend the day drawing or painting local scenes…have a look around the walls of the Glenshee accommodation providers for the end results. Stop by the Wee House of Glenshee Cafe, Shop and Visitor Centre (formerly Glenshee Pottery) for a selection of quality local crafts, gifts and produce, as well as enjoying home-baking, teas, coffees and light lunches. Wildlife: Glenshee wintery weather brings herds of wild red deer close to the road and 100’s of beasts can often be seen foraging for food at the northern end of the Glen near the Ski Centre. Golden eagle soar and hunt over the mountains and on high heathery ground, you might also catch a glimpse of grouse, mountain hare and ptarmigan. Snowsports: Glenshee is home to one of Britain’s most popular ski areas and has the largest lift system in Britain with no less than 38 runs extending over four mountains. The area offers downhill skiing, snowboarding and telemark skiing and numerous local companies hire equipment. Courses and instruction are also available for winter mountaineering, ski touring and snow and ice climbing. Relaxing: For those that just wish to relax and take time out from the hustle and bustle……peace and tranquillity abound amongst the mountains and gorges of Glenshee……….stop…….listen to the fairies……… and relax. Indoor- sports hall (basketball, badminton), archery, climbing wall, crate climbing, games room, tables tennis, pool, table football, in line skating. Outdoor- kayaking, raft races, glenshee challenge (team building), trim track, ropes course, gorge walking, climbing and abseiling, ski/snowboard instruction, BBQ area. 9 hole golf course, fishing – stocked loch and burn trout, stalking, grouse shooting, urs, tennis court. Salmon and trout fishing, stalking, rough shooting. Scotland’s largest ski centre, ski/snowboard hire and instruction, ski lifts and summer uplift. Family Activity days, mountain bike hire, clay rifle shooting, archery/cross bows, rock climbing and abseiling, ropes course, zip wire, indoor climbing, kayaking, canyoning, gorge walking, cliff jumping, waterfall abseils, summer and winter mountaineering, ski/snowboard hire and instruction.